I was an extra in the movie along with my friends, Don, Bill, Derrick, Chris, Scott Adam, Tiffany, Phoebe, Mark, and I know I will forget someone, sorry, but it was 12 days of BLISS !!!! I cannot even describe in words what it's like to be part of a History making event such as this, but when I have more time, and the knowledge to access the site on my own, I will add more to this story, so here goes....a quick wrap.......................WOW, Where to even start, hum, meeting most of The Main Cast, The Crew, The Stuntmen, or dozens of other Extras like me. Well, The Ride in the General Lee from Base Camp to the filming site, at a HIGH SPEED, YEEEE HAW!!!! Caught on video, AWESOME !!!!! Visiting the Real Dukes Farm House ( 850 acres ), this state has some of the nicest people you would ever want to meet, or the Wrap Party ??? ?, AND, Yes, I was invited to the 2nd Unit Cast and Crew Wrap Party, where I again met many of the cast and most importantly, the Main people behind the movie, the Crew, the Stunt People, and of course we HUNG OUT WITH Johnny Knoxville ( the New Luke Duke ), and Rhys Millen ( Stunt Driver / Bo Stunt Double ), we even had a sneak preview of the movie, AWESOME !!!!! Johnny even came outside and autographed Our Hazzard County Sheriff's car, as did Kevin Heffernan ( he plays Sheev, a friend of the Duke Boys ). was yelling at ENOS played by Micheal Weston, because his " Big White Caddy Convertible "
....and that's all I can say, lol......................IT WAS "AWESOME"!!!!!! Joe Don Baker 'Walking Tall' and Paul! for using their site to host my photos. TO USE THEIR SITE TO HOST MY PHOTOS. Under The Canadian Dukes Museum or my name. 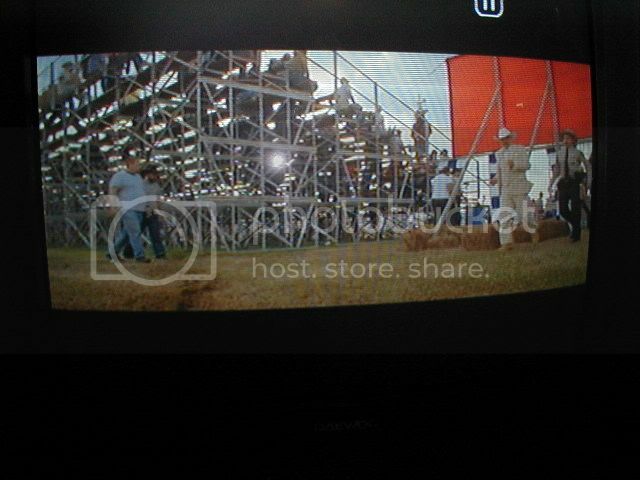 Here was one of My Best Parts in the 2005 Dukes of Hazzard Movie, we got to walk past Boss Hogg and Enos in this scene.